Compression Garments – Do They Help with Running? I returned from a Disney vacation with my family last week. While there, I saw all the runners who had just finished the marathon. 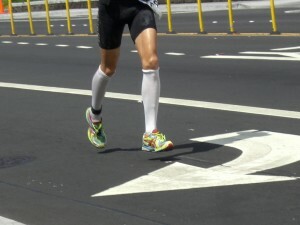 Several of them had compression socks and I was inspired to write today’s blog. In 2009, I wrote a blog post on soleus strains, the Anatomy of a Soleus Injury. It is a widely read post about a commonly misdiagnosed issue and brings many inquiries as to how to solve this condition that plagues runners. One question I often get is will compression socks help? Over the past few years, I have seen a proliferation in the use of compression socks in the recreational running community. There is no conclusive evidence that these garments will prevent muscle strains, but research does indicate that perceived exertion is lower and the psychological impact of wearing the garment may aid runners. I have not tried these myself, but some of my clients swear by them. The idea of supporting/compressing soft tissue is certainly not new and many find some comfort in it. We need more studies specific to injured populations to accurately evaluate the impact on those recovering from gastroc/soleus strains. With that said, I am in favor of any modality that may allow athletes to train and compete with more confidence and less perceived exertion even if there is no direct measurable performance gain. While I will stop short of endorsing these compression socks, I do see some potential benefits for those coming back from an injury in terms of recovery that warrant some consideration until they resume their prior levels of activity pain free. For runners suffering from muscle injuries, utilizing soft tissue mobilization, stretching, strengthening, and proper running progression is still a an absolute must. We have to question the use of calf compression sleeves and poorly fitting compression socks as a recovery aide after running. Runners have a higher risk for DVT after running then the general population. Compression could cause pooling of blood during rest and multiply the risk for DVT during recovery from running. Have you seen any studies about DVT risk and these stockings? No I gave a pair sleeves to a researcher. It makes sence combining risk factors would increase risk. I was wondering if you ever thought of changing the page layout of your website? Its very well written; I love what youve got to say. But maybe you could a little more in the way of content so people could connect with it better. Youve got an awful lot of text for only having one or two images. Maybe you could space it out better? Brian Schiff on Should I Have Shoulder Surgery? Becky on Should I Have Shoulder Surgery?